Lucy Wainwright Roche has always shown an independent streak, right from the day she elected to pursue a conventional teaching career rather than instantly ride on the crest of being part of a family with a rich musical heritage. Even now when the genetic pull of exploring her inherent talent has led to the journey from classroom to microphone, she is determined to strike out alone and plot a very individual route to success and recognition. So five years on from the career changing decision, Lucy is still prepared to jump on a plane and be content to singularly undertake a week long low key UK tour, not really knowing what response she is going to get. Yet on the evidence of this penultimate show in the upstairs music room of a suburban Birmingham pub, greater awareness on a much larger scale is surely not too far in the future. Over the course of the evening, Lucy grew in confidence as she entertained the handful of regular concert goers present with a standard two half set comprising of a selection of both self written songs and carefully selected covers, of which virtually all have appeared on her three short releases to date. It was not surprising that her most recent record, the 2010 album simply titled ‘Lucy’ , featured prominently with the opening track ‘Once In’ chosen to be the first song of the evening. Also featuring in the first half from this album were ‘October’, ‘Starting Square’ and a song inspired by a never to be forgotten personal experience of a date ending in a London hospital, hence the song title ‘Accident and Emergency’. After previous visits to the UK, Lucy should really know about the generally reserved nature of British audiences, but she attempted to generate some participation with her version of Springsteen’s ‘Hungry Heart’. By contrast, prior to showcasing her one new, yet to be titled, song of the night, she recounted a tale of an audience fight breaking out the previous evening at her Manchester show. There is no doubt that Lucy possesses all the qualities to be another top notch performer from the New York folk scene. Her classical style vocals have a captivating edge to them that blends perfectly with her simple but effective guitar playing. While her thoughtful and illustrative lyrics brings to life the stories and places that she yearns to portray with the aid of her gifted song writing skills. This really came to the fore in the second part of the show when she performed probably the two best songs of the evening , ‘Statesville’ and ‘Open Season’, the latter displaying her soft spot for the fading glory of Coney Island in her native Brooklyn. 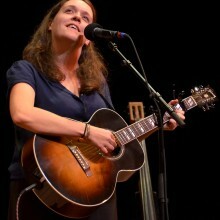 Despite the independent nature of Lucy’s route to success, she does make numerous references to her family and on this evening apart from mentioning her appearance in Birmingham a few years ago with her father, Loudon Wainwright III, she includes the song ‘Runs in the Family’ in her set. This was written by her Aunt Terre, a member of highly successful vocal group The Roches along with Lucy’s mother, Suzzy. Also, prior to introducing the song ‘Poison’, she tongue in cheek made reference to some of the family politics that arises which is surely inevitable in such a pool of intense talent. The folk standard ‘Wild Mountain Thyme’ also made an appearance in the second set before Lucy chose to end the show with a cover of Fleetwood Mac’s ‘Everywhere’ which showed her desire to mix the old with the contemporary in order to create a blend of folk rock with a traditional feel to it. Those present were appreciative of the evening’s entertainment presented by Lucy and maybe they might just take time to savour the intimate setting as this young lady definitely has the talent to take her career to a lot higher level.